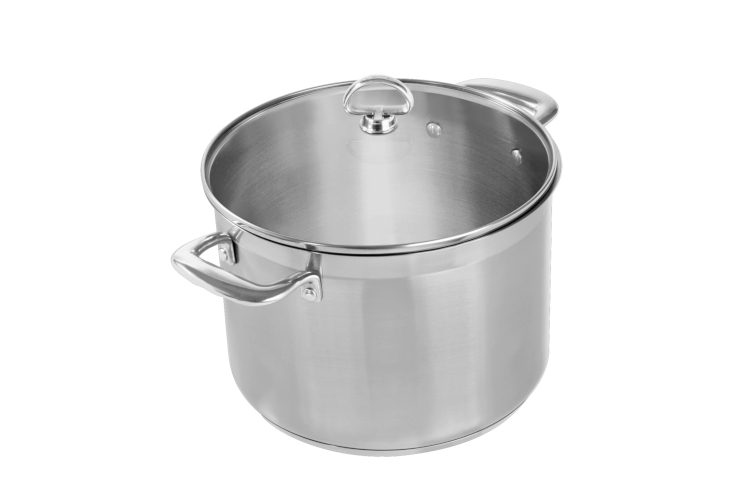 This lovely stainless steel cookware features ergonomic stay cool handles to make handling safe and easy. You will also enjoy the fact that all pans have flared brims for clean pouring. The tempered glass lids allow you to check the progress of what's cooking. The flat bottoms make these pans stable on flat cook tops and they are safe for use on all cook tops including induction. What you can't see is equally impressive. This cookware is made of 21/0 stainless steel which has copper for superior conductivity, titanium for strength and 21% chromium to resist corrosion. This steel does not have any nickel in it which is found in most stainless steel cookware. Nickel was not incorporated in this steel because it is an allergen and could leach during boiling. The Chantal 21 Stainless nonstick pans feature a ceramic surface that is PFOA and PTFE free so you don't need to worry about unnecessary exposure to unpleasant elements from nonstick cooking. Chantal Induction 21 Stainless Steel Cookware, beautiful inside and out!